Dental trauma – injury to the teeth and its associated periodontal ligament, gums and the alveolar bone; as well as the nearby soft tissues including the lips and tongue. Irreparable tooth disease – excessive damage to the tooth due to tooth decay or periodontal disease that renders the tooth dead. Dentists will attempt to save the tooth through crown restoration or a root canal procedure. Extraction will only be done if the tooth is beyond saving. Note that dentists will do everything possible to save a tooth. Extraction is done if the tooth cannot be restored and is causing pain. The procedure for extracting tooth depends on the situation and the patient’s condition. Let’s look at what each entails. A tooth that can be seen in the mouth is extracted. First, the tooth is loosened with an instrument called an elevator. The dentist then uses forceps to remove the tooth. A surgical procedure is necessary if the tooth has not erupted in the mouth or if it broke at the gum line. In this, the dental surgeon makes a small incision into the gum to remove the impacted wisdom tooth or broken tooth. Tooth extraction begins with a shot of anaesthetic for the tooth, gum and bone tissue surrounding it. How much you feel the bite of the needle essentially depends on the type of tissue in which the shot of anaesthetic is given. Insertion of the needle – the dentist initially pierces the skin around your tooth in a pin-prick fashion. This should be painless, if not the pain will only last a split second. Placement of the needle – Once your doctor has inserted the needle, he then moves it to the particular tissue where he needs to deposit the anaesthetic. You may feel some discomfort. Ask your dentist how to minimise it. Depositing of the anaesthetic – after the needle is placed, the anaesthetic solution is released into the tissue. This process looks to numb the tooth and surrounding areas, a necessary step before the tooth is removed. When a tooth is extracted, what happens is that the tooth is pulled from its socket (in jawbone). The tooth is normally firmly encased in the socket, and held in place by a ligament. To remove the tooth, the doctor enlarges the socket before he can separate the tooth from the ligament, then out of the socket. The bone that encases the root of the tooth is relatively spongy. Rocking the tooth back and forth against the socket walls, therefore, causes the bone to compress. Eventually, there would be enough space and the tooth is separated from the ligament. To grasp or apply pressure on the tooth and remove it, dentists use extraction forceps and elevators. These are plier-like instruments used to grasp and pull teeth. A dentist usually has a number of extraction forceps. Each is tailored to the shapes of teeth and can direct pressure to teeth. Forceps are also used to rotate the tooth back and forth so that it can easily be tear away from the ligament. These resemble small screwdrivers. They are designed to go between the tooth and its surrounding bone. Forcing the elevator into this space and twisting it around presses the tooth and rocks it against the bone. In this way, the dentist can expand the socket and separate the tooth from its ligament. The anaesthetics conk out the nerve fibres that transmit pain. They, however, do not keep you from feeling the sensation of pressure. With the pain transmitters become numb, you should not feel any pain at all. If you feel some pain, don’t hesitate to tell your dentist. This means your tooth has not been adequately anesthetized. Just be honest about what you are feeling during the whole process. But be careful. Do not mistake the feeling of pressure with that of pain. Doing so would have your dentist needlessly giving you additional quantities of anaesthetic. This, in turn, may place you at some risk of medical complications. Pressure comes from the rocking of the tooth. Unlike pain, you feel this as the anaesthetic does little to the nerves that transmit the feeling of pressure. You won’t always hear noise. If any, you may hear a minor snap or creaking sound during the tooth extraction. This may come from the tooth and the socket, which are both hard tissues. This is perfectly normal. He’ll typically remove any infected or pathologic tissue by scraping the walls of the socket. He’ll also compress the socket using his finger to bring back its size. The dentist will also round off any sharp bone edges and evaluate the socket for any sinus complications (in case it’s the upper back tooth). He’ll wash out the socket to remove any tooth fragment or loose bone. The dentist may also put gauze to stop bleeding in the socket. Expect the dentist to stitch up the extraction site in case of a surgical tooth extraction or if several teeth have been removed in a row. 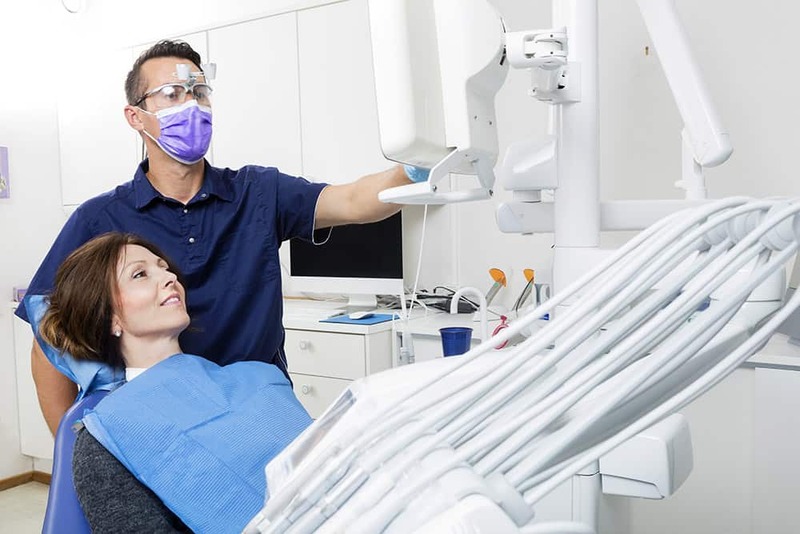 The dentist places a folded gauze over the site of tooth extraction and asks you to bite down on it to create firm pressure, which will control bleeding. You may be required to retain the firm pressure on the bite for about an hour. Your doctor may give you an ice pack that you will put against your face if in case he expects post-operative swelling. With your tooth gone, you’ll need time to recover. This usually takes a few days. During this time, you have to reduce the risk of infection, minimize discomfort and generally speed up your recovery. Bite gently but firmly on the gauze pad the dentist places on your mouth to let a clot form in the tooth socket. Change gauze pads before they are soaked in blood. Take your painkillers as prescribed. Relax for a minimum of 24 hours after the extraction. During the same period, do not rinse your mouth or spit forcefully. This may dislodge the clot formed in the socket. Avoid drinking from a straw for the first one day or 24 hours. Keep from smoking. That can inhibit your healing. Take soft foods day after the extraction. Your options may include soup, yoghurt, pudding or applesauce. Solid foods should come into your diet only gradually to allow your extraction site to heal. Rinse your mouth the following day (after 24 hours) with a solution of 8 ounces of warm water and 1/2 teaspoonful of salt. Prop your head with a pillow when lying down so you don’t prolong bleeding. Be sure to avoid the extraction site when you brush and floss. Once the anaesthesia wears off, you will normally feel some pain. It is also normal to experience swelling within 24 hours after the extraction. There are however some instances that need the attention of your dentist. For starters, if you feel severe pain and/or bleeding more than four hours after the procedure, be sure to call your dentist and let him/her know about it. Also alert your dentist if there are signs of infection such as fever and chills, or if you are vomiting or have severe nausea. The doctor should also know if there are any incidences of redness, swelling or excessive discharge from the affected area. Good dentists extract a tooth in the least invasive way possible. This does not, however, mean it’s fun. You can avoid tooth extraction altogether if you properly observe oral hygiene and visit a dentist regularly.